Ethiopia: Ethnic nationalism and the Gondar protests – Satenaw Ethioopian News & Breaking News: Your right to know! An analysis on what the rising ethnic nationalism among the historically powerful Amhara means for the country’s future. Amba Giorgis, Ethiopia – Etenesh* sits alone on a worn cow skin in her mud-walled home in Amba Giorgis, a small Ethiopian market town in the northerly Amhara region. Her husband, a merchant, was arrested early in November, due to his alleged participation in anti-government protests over the last few months. 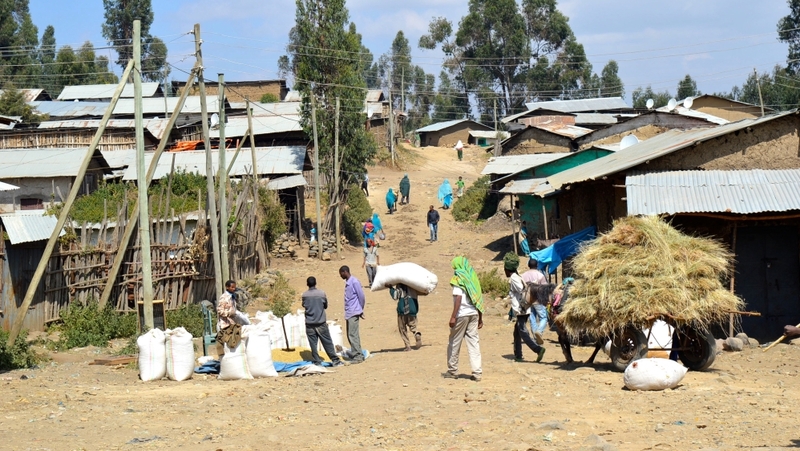 Talk of arrests is prevalent in Amba Giorgis, which is part of the North Gondar district experiencing clashes between armed farmers and the military. On the edge of town, government soldiers man a new checkpoint. They moved into a road construction camp, following the declaration of a sweeping state of emergency on October 8 in response to the unrest among Ethiopia’s two largest ethnic groups: the Oromo, who make up around one-third of the population, and the Amhara. On July 31, residents of Gondar, which is around 700km north of the capital, Addis Ababa, came out to demonstrate amid a long-standing territorial dispute with the neighbouring Tigray region. During Ethiopia’s transition from a unitary to a federal state in the early 1990s, some Amhara claim they lost territory to Tigrayans when the country was restructured along ethnolinguistic lines. The demonstrations have been used as a platform to voice discontent over alleged government repression of the Amhara as well as to promote a budding ethnic nationalism among them. The Amhara are the second-largest ethnic group in Ethiopia, constituting 27 percent in the country of nearly 100 million people. The ruling coalition, the Ethiopian Peoples’ Revolutionary Democratic Front (EPRDF), is a grouping of four ethnic-based parties, including Oromo, Amhara and Tigray parties. The Tigray People’s Liberation Front ( TPLF), is the founder of the EPRDF and is perceived to be the powerhouse of the coalition, even though Tigrayans represent just six percent of the population. Pro-TPLF commentators believe that the Amhara wing of the coalition, the Amhara National Democratic Movement, gave its blessing to the Gondar protest as part of an attempt to reduce TPLF dominance. 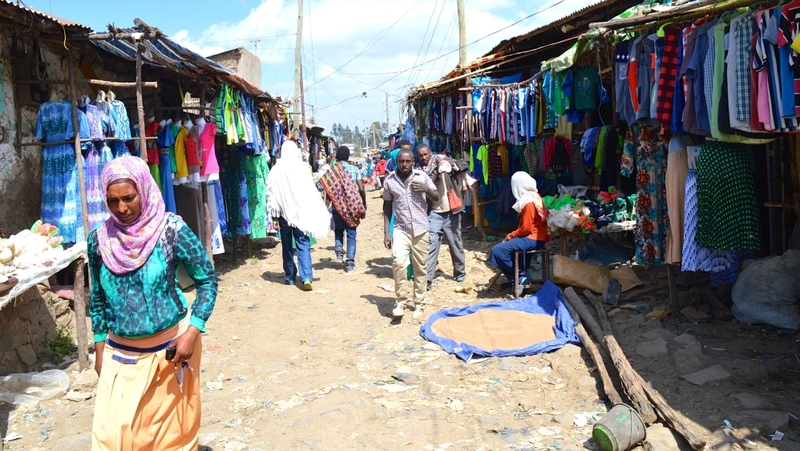 But events gathered momentum, when the sentiments on display in Gondar reverberated in the following weeks, as thousands of ethnic Amhara hit the streets in towns like Amba Giorgis. During the protests, slogans reflected a sense of victimisation. “Being an Amhara is not a crime,” read one. “Respect Amharaness,” said another. 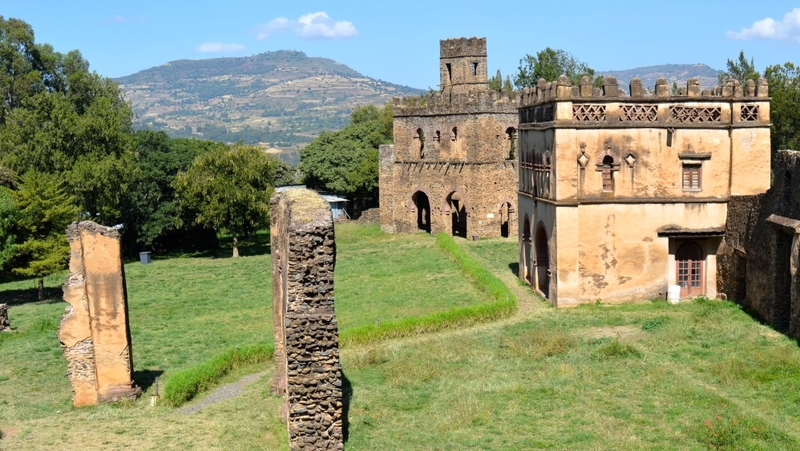 Properties associated with the ruling coalition were attacked, and the main road leading to the tourist-magnet Simien Mountains was blockaded. The government’s emergency decree, which, among other things, bans most political activity, including watching opposition satellite channels, has seen tens of thousands detained on suspicion of being party to the unrest. “Some 11,607 individuals have so far been detained in six prisons, of which 347 are female, in connection with the state of emergency declared in the country,” official Taddesse Hordofa said in a televised statement on November 12 after the state of emergency was implemented. The measure has returned a degree of order to Ethiopia. However, underlying issues remain. The Amhara held privileged positions during the imperial era that ended with Emperor Haile Selassie’s overthrow in 1974. Some EPRDF’s federalists insist that they remain loyal to ideas from that time and are suspicious of the current arrangement. For hundreds of years, the language and culture of Ethiopia’s imperial courts was Amharic and, for many, advancement in career or social status depended on assimilating to it and many ambitious members of other ethnicities adopted Amhara customs. By the 20th century, the Amhara culture had become the culture of the educated and of urban “elites” who were often ethnically mixed, according to the historian, Takkle Taddese. As a result, the Amhara can be seen as “a supra ethnically conscious ethnic Ethiopian serving as the pot in which all the other ethnic groups are supposed to melt,” writes Taddese in his essay, titled: Do the Amharas Exist as a Distinct Ethnic Group? When the EPRDF came to power in 1991 and ushered in federalism, the Amhara were treated just as any other ethnic group: a collection of people with their own identity and territory – a premise with which proponents of contemporary Amhara nationalism agree. The Amhara have existed as a distinct community for thousands of years, fulfilling “all the basic markers of an ethnic group: distinct language, distinct culture, collective national memory and experience and so forth”, argues Wondwosen Tafesse, an academic based in Norway and a commentator on Amhara issues. But even with surging ethnic assertiveness, many Amhara are still likely to give precedence to pan-Ethiopian identity, as Amhara nationalism is not an end in itself, according to Wondwosen. Rather, it is a reaction to “fend off multiple attacks, real and imagined”, he says. The expulsion in 2013 of thousands of Amharas by regional officials from Southern People’s Regional State and Benishangul-Gumuz , according to a report by The Human Rights Congress of Ethiopia, is raised to support allegations that the government deliberatelytargets ethnic Amharas. For opposing Amhara elites, who had to grapple with the pre-eminent questions of identity during EPRDF rule, ethnic nationalism was antithetical to pan-Ethiopian nationalism. Even with a growing sense of ethnic nationalism, pan-Ethiopian nationalism still enjoys wider acceptance among the Amhara elites, argues Chalachew Taddese, a contributor for Wazema, a non-profit radio station founded by exiled Ethiopian journalists based in Europe and the United States. Amhara nationalists, therefore, have to tackle those who see an excessive ethnic focus as compromising the nation’s integrity. Taddese says two factors have contributed to the increase in Amhara identity: “A growing perception of ethnic discrimination” by the government and “persistent anti-Amhara campaigns” by Oromo elites, who portray the group as “a historical coloniser and victimiser of all other ethnic groups”. If Amhara nationalism grows in prominence, the relationship with Oromo nationalism might be decisive for the country’s future. During the protests, Oromo and Amhara nationalists displayed signs of solidarity in the face of what they believed to be a common enemy: the TPLF. But, there were always questions about the camaraderie and whether it was meaningful and sustainable. The Oromo rose up in November 2015 amid complaints that they have been politically and economically marginalised under a federal system that promised them autonomy. The protests were a testament to a reinvigorated Oromo nationalism. Unlike its nascent Amhara equivalent, Oromo nationalism goes back a half-century, with an established ideology, institutions and aspirations. Any secessionist Oromo tendencies cause alarm among Amharas, who promote their identity within a multinational Ethiopia. But Oromo nationalism is also predicated upon alleged persecution by Amhara elites during the imperial era. Accordingly, Amhara nationalism, if it solidifies, “will be forced to counteract the narratives of Oromo elites”, Chalachew says. One battleground will be the legacy of Menelik II, a late 19th-century emperor whose military campaigns shaped the boundaries of modern Ethiopia. Oromo nationalists, who want to remove his statue in the heart of Addis Ababa, see him as an Amhara imperialist conqueror. Amid these immediate and pressing challenges, the rise in Amhara nationalism creates more turbulence in the region, raising questions that no one yet seems able to answer. *Names has been changed for privacy purposes.